Lock ´n Load Tactical Solo is the next evolution in our Lock ´n Load Tactical series. LnLTS is a solo system that allows players to be able to play the scenarios that come with the games as well as ones created with our Battle Generators. We went beyond that and provided one solitaire system that would work across the entire Lock ´n Load Tactical series past, present and future games. We also wanted players to be able to play the scenarios that come with the games, so LnLTS makes this possible. 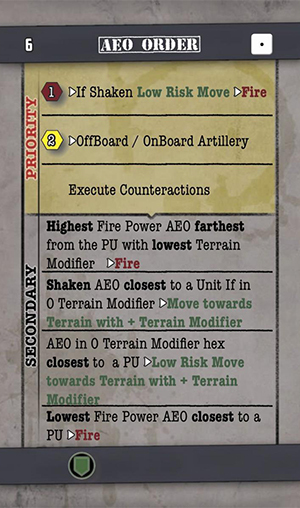 There will be a few scenarios that won´t play as smoothly as most of the scenarios due to events or special rules. LnLTS will work with any scenario generated by our LnLT Battle Generators. 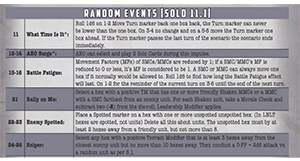 Included with LnLTS is a system is a random events generator that is optional to add a little something special to your games and could be used even in two player games. Lock ´n Load Tactical: Solo was developed by Bob Bicket, Sean Druelinger and David Heath and is based and licensed from Academy Games´s Solo game design. We like to thank Uwe Eickert for allowing us to create this edition for the Lock ´n Load Tactical series.